A person who slips or trips on another person’s property may be entitled to damages for resultant injuries. 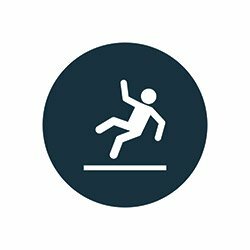 In order for a slip and fall to be compensable, there must have been an unsafe condition on the property. Unsafe conditions include icy accumulation, wet or slippery floors, badly damaged sidewalks and debris underfoot, among many others. In addition to the existence of unsafe conditions, in order for the injury to be compensable, the owner must have known that the dangerous condition existed and allowed it to persist. This is the most difficult element for a victim in a slip and fall case to prove. Sometimes, the owner of the property causes the dangerous condition, such as when the floors of a department store are freshly mopped and slippery. At other times, the danger is not caused by the owner, but is obviously apparent, as is the case after a snowstorm. The owner of the property is entitled to a grace period to correct dangerous conditions. But, while the problem is being fixed, the owner should put up a notice to warn individuals of the possible danger. Yellow boards are commonly used to warn of wet floors, and orange cones are often used to warn of ongoing construction. If the dangerous condition is obvious enough to a casual observer, it may not be compensable since an individual has a duty to use a reasonable degree of care for his or her own safety. Even if the owner is at fault, if the injury is no more severe than a bruise or a slight sprain, a lawsuit is probably not the best course of action. Lawsuits are usually reserved for more serious injuries like broken bones or spinal damage. Only an experienced attorney can advise the individual involved in a slip and fall incident as to whether the case is strong enough to warrant a claim.